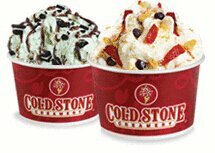 Cold Stone Creamery offers Buy 1 Get 1 Free with My Cold Stone Club. Join eClub and get Two Creations for the price of one, plus much, much more. Click here to print coupon directly.